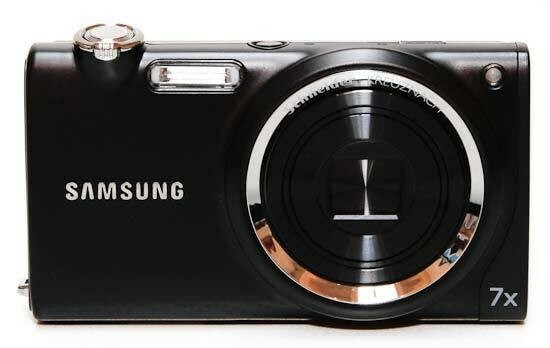 The Samsung ST5500 (also known as the CL80) is an innovative 14.2-megapixel digital camera with integrated Wi-Fi connectivity and a 3.7 inch WVGA AMOLED touch-screen. Using an available Wi-Fi connection, users can send a digital image to any email address using the ST5500's touch-screen QWERTY keypad or the built-in address book. The ST5500 also supports two other wireless connectivity options, Bluetooth 2.0 and DLNA, and can upload images directly to popular websites such as Facebook, Picasa and YouTube. Also on offer are a Schneider-Kreuznach branded 7x optical zoom lens with optical image stabilisation, 720p HD video recording at 30 frames-per-second in the H.264 format, a Smart Gesture touch-screen user interface with a built-in Acceleration Sensor that responds to finger commands, and a One Touch Auto Focus feature that allows you to focus on a specific part of the frame simply by touching the desired area. The Samsung ST5500 / CL80 is available in black, grey or orange priced at £349.99 / $399.99. The Samsung ST5500 / CL80 is the first ever digital camera to be manufactured using a clever technique called hydro-forming. This basically allows Samsung's designers to incorporate appealing curved areas, especially around the lens, more seamless bonding and higher quality surfaces than most other digicams. The ST5500 has an internal stainless-steel frame around which its high-quality plastic body is formed. Another impressively subtle touch is the lens specification information that magically only appears when the lens is extended, appearing in the concave reflective ring that surrounds the lens. Very clever, if a little superficial. The ST5500 also inherits the slanted design of several of its stable-mates which places the back of the camera at a seven degree angle, proving useful for taking self-portraits and group shots as the camera can be placed on a flat surface and still capture the complete subject. The shutter button is conversely slanted forwards to make it easier to use. At first glance the ST5500 may look like most other digital cameras, but Samsung have obviously put a lot of effort into the little touches that help set it apart from its competitors. The ST5500 has a 7x optical lens that extends to provide a 31-217mm focal length, versatile enough for anything from landscapes to candid head and shoulder portraits, although there are other similarly-sized models that offer both a bigger zoom range and a wider-angle setting. In terms of apertures the ST5500's lens isn't particularly fast - f/3.3 at 31mm and f/5.5 at 217mm - but it does have built-in optical stabilisation which helps out in low-light. The lens dominates proceedings at the front of the ST5500, taking up almost the full height of the face plate, with the built-in flash bulb shifted over to the left out of harm's way. On the right of the lens is a small porthole-style window for the AF assist/self timer lamp. There's no hand-grip at all on the front of the ST5500 and just two thin raised columns on the rear, which makes the camera more difficult to hold steady when shooting handheld at the extremities of the zoom. Looking down on the ST5500's top plate we find six controls. Starting at the left when viewed from the rear, there's a self-explanatory playback button, two holes for the microphone, a tiny activity LED, a Power button that's a little too small and recessed for easy operation, and a tactile shutter button. Next up is the rather plasticky but responsive rocker switch for operating the zoom. Controlled by a protruding lip that falls naturally under the forefinger, the zoom takes around three seconds to travel from maximum wide angle to full telephoto - which is pretty much par for the course for its focal range. We did find on occasion that the zoom took a moment or two to 'wake up' - and that its transitions are sound-tracked by a low mechanical blur - but it's low enough to avoid being off-putting. Once you've zoomed in and got your composition how you want, with a half press of the shutter button the Samsung ST5500 is commendably swift to determine focus and exposure, the AF point highlighted in green and an operational 'beep' confirming you're good to go on and take the shot. Focus area options include Center AF, Multi AF, One Touch Shooting, which as mentioned in the introduction allows you to interactively set the focus point by tapping the touchscreen LCD (more on that below), and the even clever Smart Touch AF, which follows the subject that you have tapped on and keeps it in focus. Futhermore, you can even take the picture by holding down on the subject for two sections, although this is obviously a much slower method than using the shutter button. With little noticeable shutter lag, at highest resolution setting an image is committed to memory in just under two seconds, the screen blanking out briefly, which isn't bad at all. The rear of the ST5500 is dominated by the very large 3.7-inch AMOLED screen, which in the absence of an optical viewfinder is the only way of composing your images. The excellent screen has a very high resolution of 1,152k dots, a real treat for the eyes during both image composition and playback. We didn't have too many problems viewing the ST5500's screen in all but the brightest sunlight conditions. The ST5500 incorporates some very clever touch-screen technology, with virtually all of the camera's functions activated and controlled via its LCD. It offers one of the best interactive experiences of any digital camera that we've reviewed, thanks to a winning combination of high-resolution, intuitive menu layout, the cutting-edge screen, and some equally impressive gesture-based technology. You can do certain things, like scroll through your images or delete a picture, simply by performing a specific gesture, although often it proved quicker just to press the appropriate on-screen icon. If you're especially lazy, the ST5500's Smart Gesture feature goes even further by using the camera's built-in acceleration sensor to allow you to use gestures to perform certain actions. Flick the camera left or right to scroll through images, for example, or draw a cross to delete an image - although again it's usually quicker just to use the icons. An ever-present icon in the top-left of the screen provides quick access to the shooting modes. On offer are the expected Auto and Program settings, plus Samsung's own 'Smart Auto' mode. As it sounds, this is the manufacturer's equivalent of the intelligent auto modes on competitors from Panasonic (its Lumix range), Sony (the latest T-series Cyber-shots) and Canon (Digital IXUS family). Namely you point the ST5500 at a scene or subject that hopefully the camera recognizes, automatically adjusting its settings to deliver optimum results. This means that it's not necessary for the user to manually delve into scene modes to call up the likes of 'landscape' or 'flower'; the ST5500's operation is merely a case of point and shoot. There's also a 'Dual IS' mode, which offers both optical image stabilization and the ISO boosting digital variety. In terms of light sensitivity the Samsung ST5500 offers a very respectable range, stretching from ISO 80 up to ISO 3200. We'll of course be examining how well it does at its higher settings in the 'Image Quality' section of our review. Samsung's 'Beauty Shot' mode, useful for both acne-d adolescents and those of us who have over-indulged by automatically retouching out spots and blemishes, is the first Scene mode. Spotlighting the ST5500's intended audience as the family, Samsung clearly wants its users to have to spend as little time post-processing images as possible - if any. In addition to Beauty Shot, there are 12 other scene modes on offer. Also useful is the omnipresent Function menu which can be quickly accessed by pressing the bottom of the LCD screen, which allows quick access to some of the ST5500's key settings. As expected the amount of information and options accessed via a press of 'Fn' varies dependant on which shooting mode is selected. For example in regular auto mode the user merely has the ability to adjust image size and resolution. Choose program mode however and there's the ability to change the EV, choose metering modes, change from single shot to continuous capture, choose from the range of ISO settings, adjust white balance, set the photo style or turn the ubiquitous face detection mode on or off. Like its rivals, Samsung also allows user access to blink detection and smile shot in this mode. Finally, the full menu of options can be opened via the Menu icon in the bottom-right corner. Depending on the particular mode that the user is in, an icon illustrated vertical list provides access to four menus - Functions, Sound, Display and Settings. These include the ability to tweak operational sounds, LCD display, plus access to a setting menu, enabling memory to be formatted or previously selected functions reset. The ST5500 also has its very own Recycle Bin, with every deleted shot automatically stored in a temporary folder just in case you change your mind. The ST5500 has a wealth of wireless connectivity options, including Wi-fi, Bluetooth 2.0, and DLNA through Samsung’s AllShare feature. Using an available Wi-Fi connection, you can email an image using the built-in keyboard or by choosing an address from the camera's address book. More useful is the ability to upload images directly to several popular websites, namely Facebook, Picasa, YouTube and SamsungImaging.com, although we did miss one of the biggest players in the market, namely Flickr. Note that all images transferred through Wi-Fi are automatically reduced to a resolution of two megapixels. Samsung AllShare connects the ST5500 to other DLNA certified devices such as HDTVs and digital photo frames and works for both still and moving images. Finally, Bluetooth 2.0 connectivity is also included, although we didn't have a suitable mobile phone to test it with. Note that all images transferred via Bluetooth are automatically reduced to a resolution of one megapixel. Although it hasn't got an 'HD' suffix in the model name, the Samsung ST5500 nevertheless offers High Definition video clips, though at 1280x720 pixels rather than full HD 1920x1080. In what Samsung is claiming as a first for digital compacts in its class, these can be paused mid-recording then re-started. The user can therefore perform rudimentary 'editing' as they shoot, a clever idea that hasn't yet been picked-up by other manufacturers. Fortunately the full extent of the optical zoom is also accessible when shooting movies. The video mode provides the opportunity to either shoot at top resolution, a less memory hungry 640x480 pixels, or 320x240 pixels, all in the H.264 format. Maximum frame rate at 1280x720 resolution is 30fps, with a reduced 15fps rate also selectable. Should users however plump for the very lowest picture quality, a faster frame rate of 60fps is selectable. There are no controls on the left hand side of the ST5500 (if viewing from the rear), and there's a small camera strap eyelet on the right side plus an HDMI port for hooking the camera up to an HDTV. Increasingly common for DSLRs that also shoot movies, it's still a comparative rarity to find such on a digital compact, even if it does shoot HD video. The required HDMI cable is an optional extra though, so bear in mind if you're on a budget. Next to the HDMI port is a connector that recharges the camera, with the battery left in the camera itself, either from an electrical socket or or alternatively straight from a USB port connected to your computer. On the bottom are holes for the built-in speaker, a screw thread for attaching a tripod and alongside that a sliding cover for protecting the compartment that jointly houses the removable SD Micro media plus the provided battery. Battery life is only good for approximately 200 shots from a full charge, and that's only if you don't use the various connectivity options too much, which then reduces it to less than 150 shots - you'll definitely need a second battery for day-trips. Equally annoying is the tiny SD Micro format, which makes sense in Samsung's extensive range of mobile phones, but not in a larger camera. It's much too easy to lose in a pocket or bag, requires investment in yet another format, doesn't offer as much capacity or speed as SD / SDHC, and also needs the supplied adapter to be used in most external memory card readers. There's also some built-in storage, but enough for one photo at the highest resolution. Also included in the box is a quick-start guide as a hard copy, the full manual on CD ROM, plus a wrist strap. The Samsung ST5500 offers one of the best touchscreen interfaces that we've tried, largely thanks to the brilliant AMOLED screen, and some useful connectivity options, although it does suffer from poor battery life.